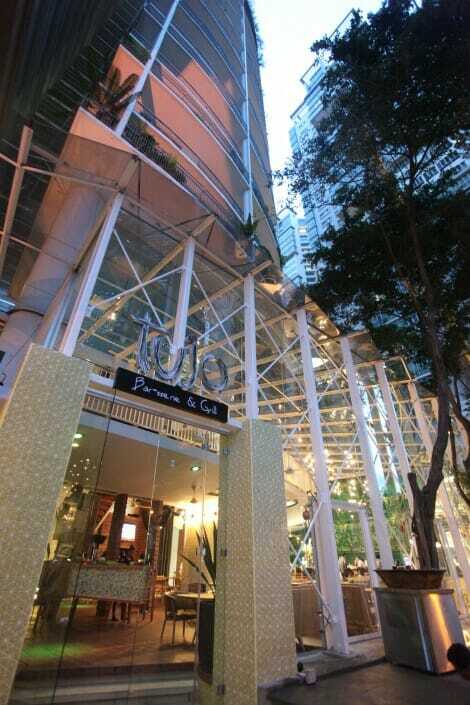 Tujo at The Ascott Residences Kuala Lumpur takes on a fun concept – A Playground – where diners can gather over food and drinks, and enjoy the simple pleasures in life. 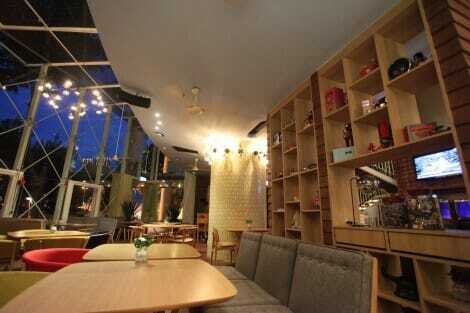 The décor is inspired by the 1960’s Danish modern design, a combination of comfort and sleek simplicity. 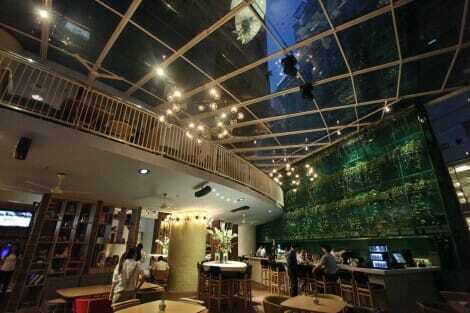 Quirky elements such as the (disorganised) front counter and modo chandeliers also add to the look and feel of Tujo. 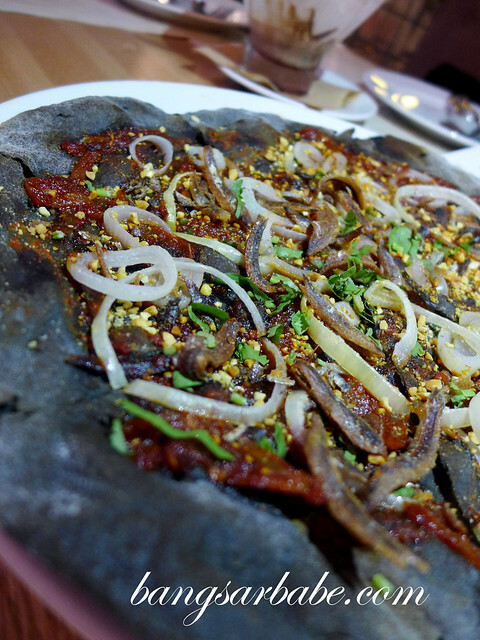 Tujo focuses on grilled items, complemented by a selection of side dishes, pizzas, pastas and local delights. I found the Caesar Salad with Chicken (RM23) quite tasty. The dressing was flavourful yet light, while the chicken slices were well seasoned and added texture to the crunchy greens. 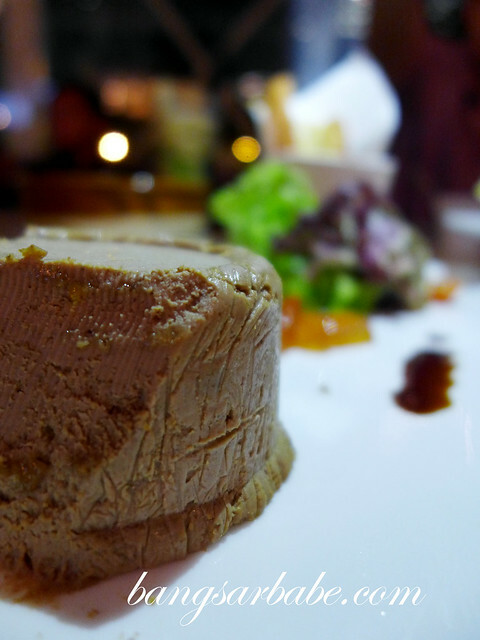 I finished most of the Liver Terrine (RM23), a pate of foie gras, chicken liver, sultanas and chives. This had just the right balance of flavours and absolutely delicious with crusty toast. So having this on my next visit! The oxtail soup (RM18) could have done with more pepper for an extra kick. That said, the oxtail pieces were meltingly tender and falling off the bone. If you’re into satays, give Tujo Stinger Satay (RM15 for 6 pieces) a try. 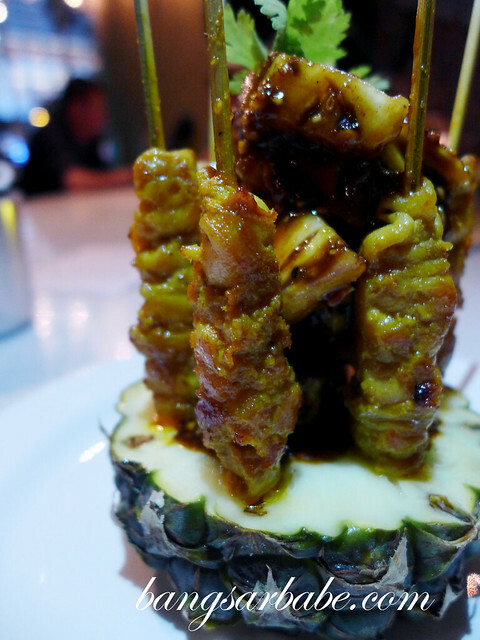 This was a tasty composition of chicken skewers, pineapple salsa, nuts & spicy shrimp paste. I found the shrimp paste highly addictive, and couldn’t stop munching on the pineapple cubes. 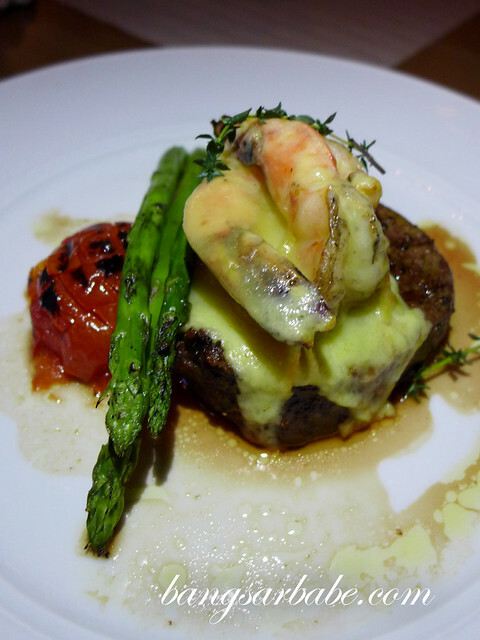 Tujo’s Parmesan Bass (RM35) came served atop of bed of fava beans. The fish, crusted and deep fried till golden brown, was smooth and flaky inside. 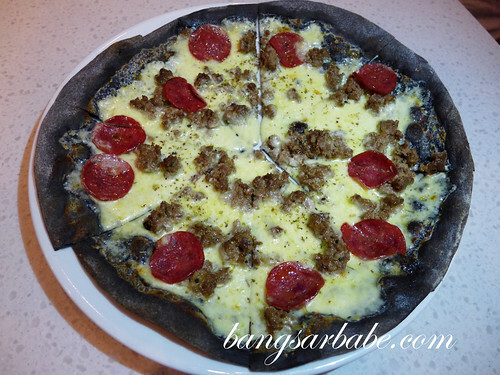 A good alternative for those who want something less heavy for dinner. 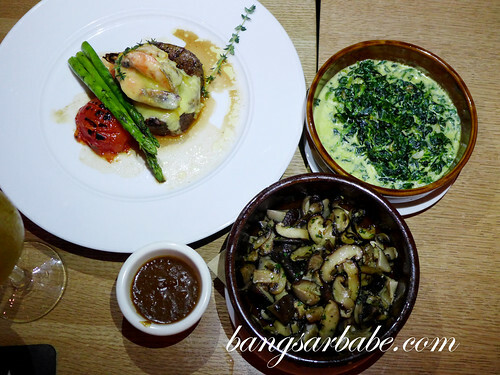 I preferred the Beef Tenderloin (RM78 for 200gm), with a side of sautéed mixed mushrooms and creamy spinach (RM8 each). 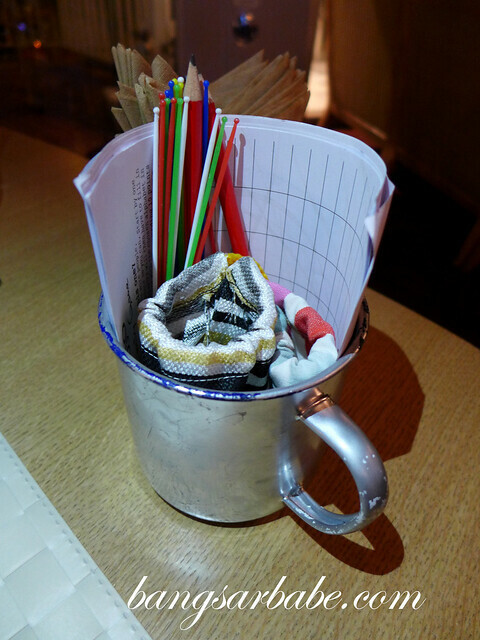 Diners get to choose from a selection of rubs – Shogayaki, Cajun, Paprika, Black Pepper, Montreal Salt and Sea Salt. While I’m more of a ribeye girl, the tenderloin was adequately tender and seasoned throughout. The Porterhouse (RM120 for 400gm) however, didn’t fare as well. I found the sides a tad tough, but I did get to indulge in some tasty fat and a juicy centre. 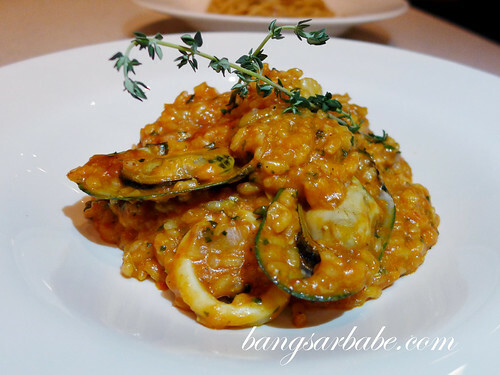 The seafood risotto (RM33) was quite decent – al dente and moist from the tomato broth. They were pretty generous with the seafood as well; I picked out two scallops, several mussels and plenty of prawns and squid rings. 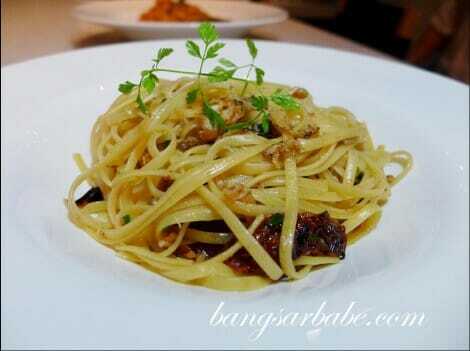 The crabmeat linguine (RM26) didn’t rock my boat. I’m generally a fan of saucy pasta dishes, so this was a tad plain for me. Malaysiana packed a wallop of flavours and textures. 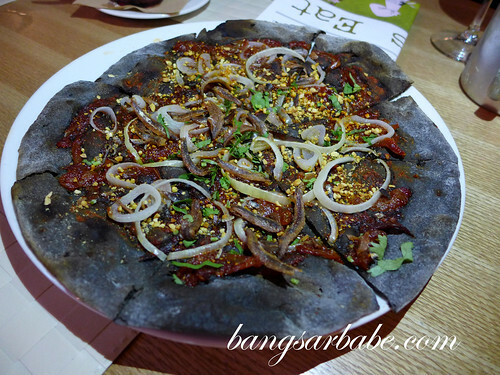 It tasted like nasi lemak, but with squid ink pizza base instead of coconut rice. Eat it while it’s hot to enjoy the crunchiness of the anchovies and nuts. I have to warn you though; the sambal is fiery hot. Best eaten with a cold pint of beer. 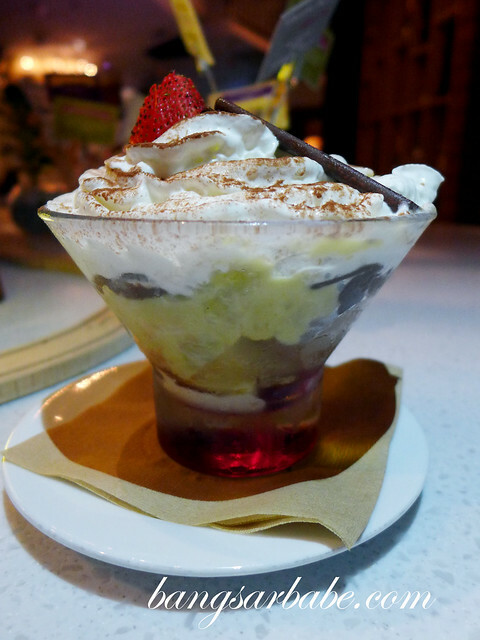 Napoli Bianco was the richest in flavour among the three. Good for sharing, for after the second or third slice, you’d be raising the white flag. Dessert was a salted caramel apple guava tart (RM20) with Haagen-daz ice cream and apple banana sundae (RM17). Both fairly simple but good in their own way. But if I had to pick one, I’d go for the sundae. Throughout dinner, we had a variety of cocktails, from sangria to a few Tujo specials. 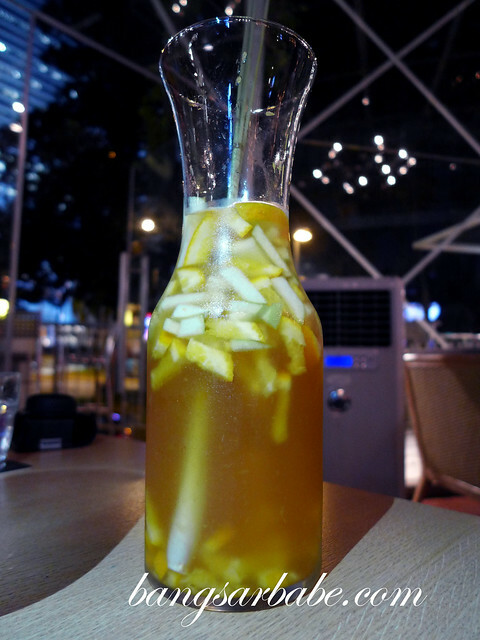 Give the peach sangria (RM19 per glass, RM90 per jug) a try – it’s light and easy to drink. 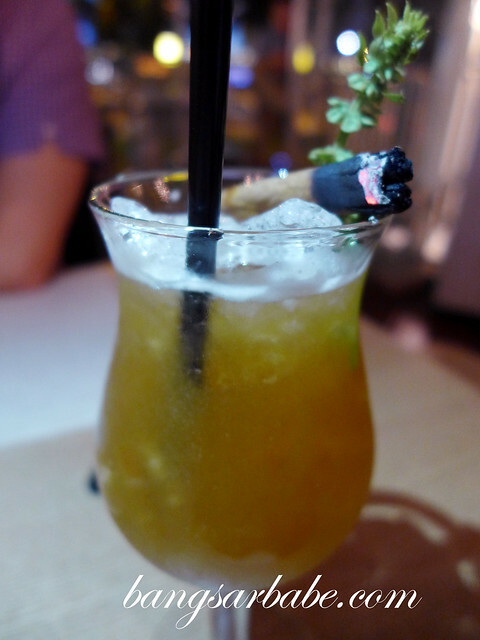 The Hazelnut Caipirinhas (RM26) was presented with a stick of cinnamon, lit up for its aroma to waft around. 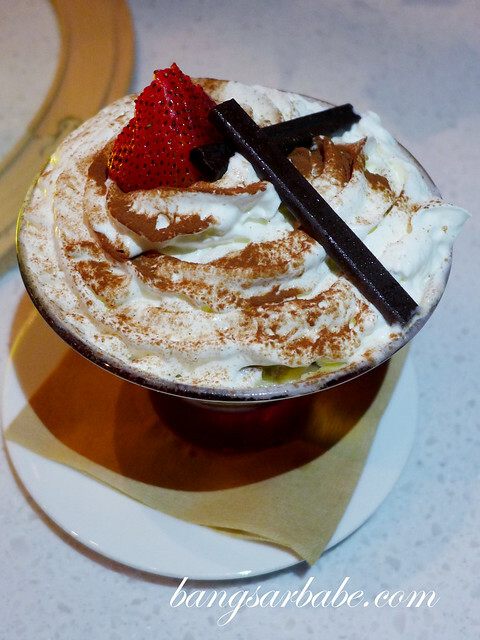 If you’re a fan of sweet-based cocktails, this is something to consider. 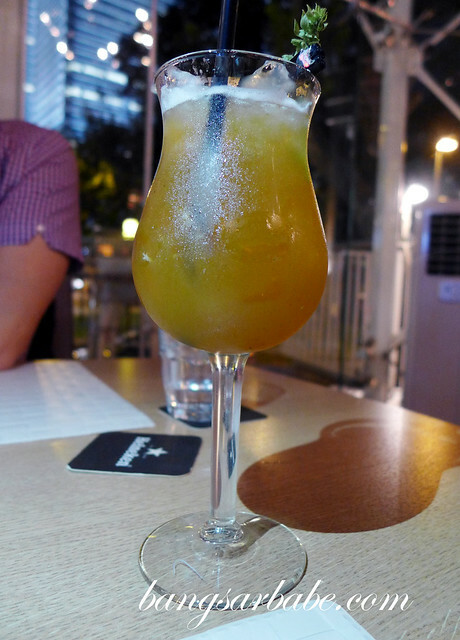 I liked Eden Melon (RM35), a concoction of gin, thyme, watermelon juice and lime juice, among others. 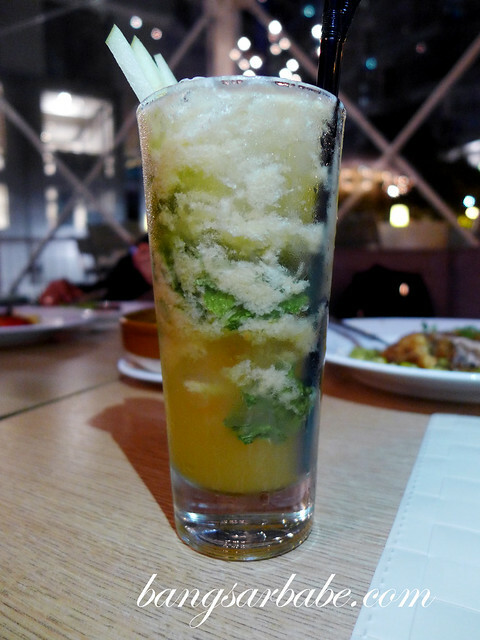 Very refreshing, this cocktail. 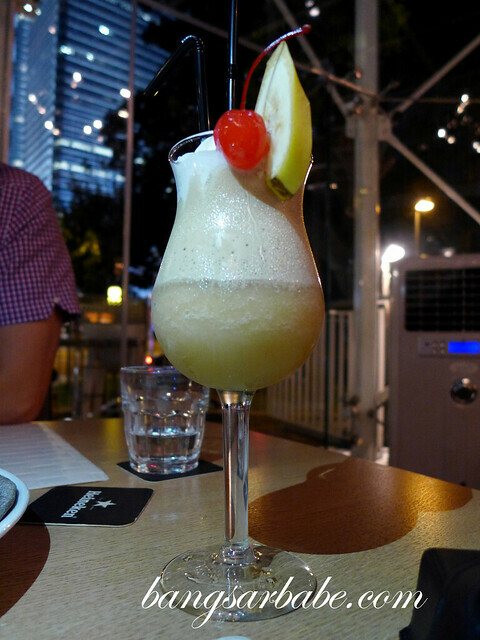 One of my favourite cocktails that night was the Crema Kahlua Rhumba (RM29). 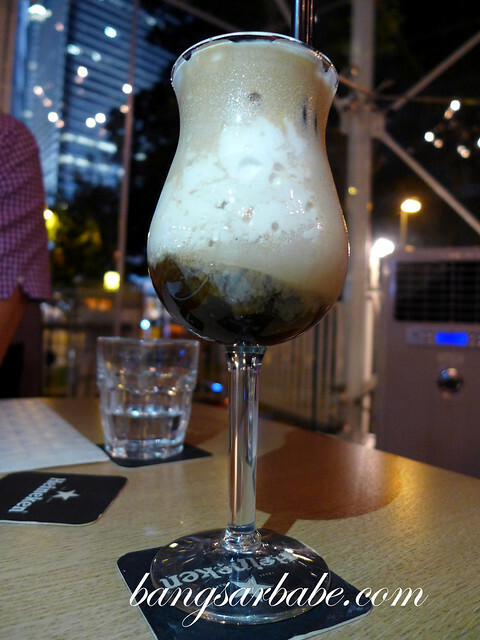 This tasted like milkshake laced with plenty of kahlua. Keyword: PLENTY. 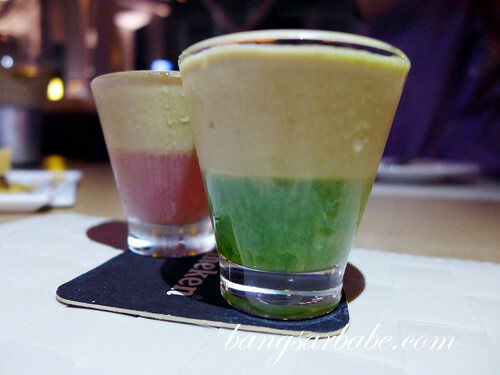 To cap off, we all down two shooters of crema squashed frog and crema dragonhead (RM22 each). It’s a miracle how I got to work at 8.30am the next morning. For more information, check out Tujo’s Facebook page here. Verdict: Pretty decent food and I love the vibe here. Also, the cocktails are good.